I was supposed to give a short talk in front of a History Happy Hour earlier this year. At the very last moment I had to beg off, but I really appreciate Len Balli and the folks at the Washington State Historical Society thinking of me. Just to be invited was pretty cool. You guys do good work. Seriously, just an aside: organizations like the Washington State Historical Society (and libraries, local historical societies, history magazines and museums) are so vital. So vital. If you aren't doing much to take advantage of what they have to give and provide them with love and support, I wish you would. At two o’clock on a Thursday morning in early April 1913 in Bucoda Murvil Lancaster was home, alone, with her baby when Charles James came crashing into the house. She was probably asleep, finding a few hours of rest between keeping her baby happy and running the household. Or, maybe she was already awake, walking her child, feeding her child. But, James smashed the early morning peace, smashing furniture and other (as the newspapers said) household goods. Charles James was looking for his wife. Mrs. James had already abandoned the family home in south Thurston County, and Charles had come looking for her. He was obviously already well down the road of intoxication, well lubricated as we might say, with enough drunken enthusiasm to invade a neighbor's house. The common thread here was that Charles James drank too much. And, when he drank too much, be became violent. What Mr. James did was not considered a discrete family affair. Domestic violence, fueled by alcohol (like today) was an important public conversation. But, in a lot of ways, to a lot of people, it was THE public policy discussion of the day. Charles James might be violent. But, should the government allow the sale of the fuel for Charles James violence? Washington has always had alcohol. The Union Brewery was established well before statehood and was the origin-point of Northwest Hops in sat right in the heart of downtown Olympia. But, almost as soon, we have had the battle between wet and dry politicians. It was one aspect of the urban/rural split. Urban areas were wet, rural areas (in general) dry. In the early 1890s a dry meeting in Olympia became so crowded so fast that the intended segregation of men and women could not be accomplished. The energetic talks of national prohibitionist speakers was slightly marred by men and women sitting together in the crowd. The organizers promised that future events would be better organized and men and women would be separated. By the time Charles James began beating his wife and tearing apart neighbors’ homes, the forces of dry had already begun turning the tide in Washington. A local dry option law was passed, and Thurston County had opted to go dry. This left many unincorporated places like Bucoda effectively out of the bar business, despite having a few bars themselves. 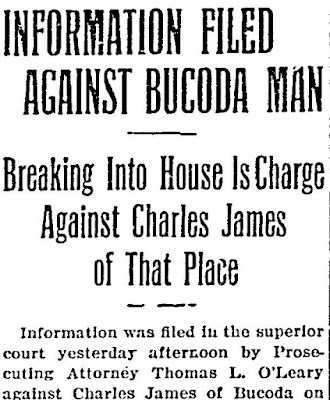 The Bucoda bar owners only option was incorporation, which (after a few starts and stops) happened in 1911. 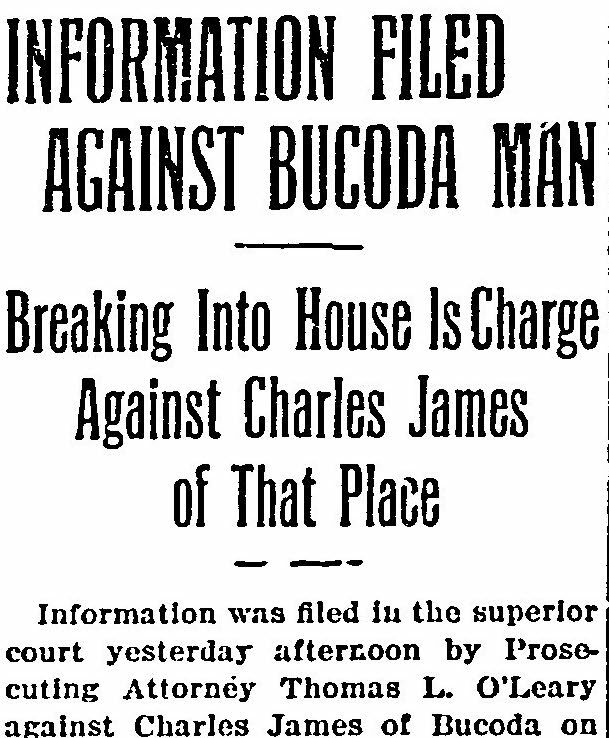 It was illegal for Charles James to find his fuel in Thurston County, but the city fathers of Bucoda provided. In 1914, the prohibition and sale of alcohol was banned in Washington. Not the consumption though. In 1918, Washington went “Bone Dry,” which ended any loopholes left open in 1914. And, in 1919, Prohibition started nationwide. Liquor is mostly water, so it found a way. And, of course, Olympia was the state capitol. And, the Hotel Olympian was were all the action was, across the street from the then state capitol. Built in 1918 for the expressed purpose of providing housing for state legislators while they were in town. Rep. Maude Sweetman was the only woman in the legislature by the late 1920s, and lived in the Hotel Olympian. She provides a clear contrast of what remained of the dry coalition in those later prohibition years and the actual state of things in the hotel Olympian and otherwise. ...their drunken voices gave to the early morning air the confusion of their tongues, night after night through a whole session. By 1932, Washington was again ahead of the game when an initiative passed by 60 percent, repealing most of the dry laws. In 1933, the United States matched pace with the repeal of the 18th Amendment. And, in early 1934, former Olympia Mayor and state Senator E.N. Steele led the cause to write the rules that got Washington wet again. The Steele Act (which stayed intact until very recently) was defended from over 150 amendments on the floor of the Senate. In one of those rare moments when Olympia really did lead the state, George F. Yantis (another Olympia legislator) guided the Steele Act through the house as the speaker. You can find a lot of explanations about why prohibition ended. It had become, in over a decade, too hard to prevent people from drinking. It was a joke, an openly mocked public policy against what people were going to do anyway. People with money found liquor and it was unfair for the rest of us not to enjoy. Charles James in fact did not spend much time in jail. Found guilty in May, he was sentenced to three months in the county jail. But only after a few weeks, Mrs. James reached out to the governor. In front of the governor himself, the prisoner of Thurston County (Charles James was literally the only prisoner in the jail at that moment) promised he wouldn’t drink anymore. He admitted alcohol got him into trouble and that he would become dry himself. And, the governor let him go. Just one more note: I really liked the idea of reading this outloud, so I may at some point, turn it into a podcast sort of thing.